Given the mass of an amount of liquid water in milligrams, you may wish to know the volume of that liquid in fluid ounces. This involves the conversion of a unit of mass to a unit of volume. Performing this conversion requires some simple calculation in the case of water. Calculate the mass of the liquid in terms of grams. For example, you may be working with 800 milligrams of liquid water at 50 degrees Celsius. This translates into 800/1000 = 0.8 grams of water. Multiply the mass of the water in grams by the appropriate conversion factor. This factor is equal to 0.035. Thus, 0.8 grams of water times the conversion factor is equal to 0.8 x 0.035 = 0.028 fluid ounces. For any liquid other than water, the conversion factor mentioned in Step 2 above may not be accurate. The appropriate conversion factor will differ for liquids of different densities, and for the same liquid at different temperatures. 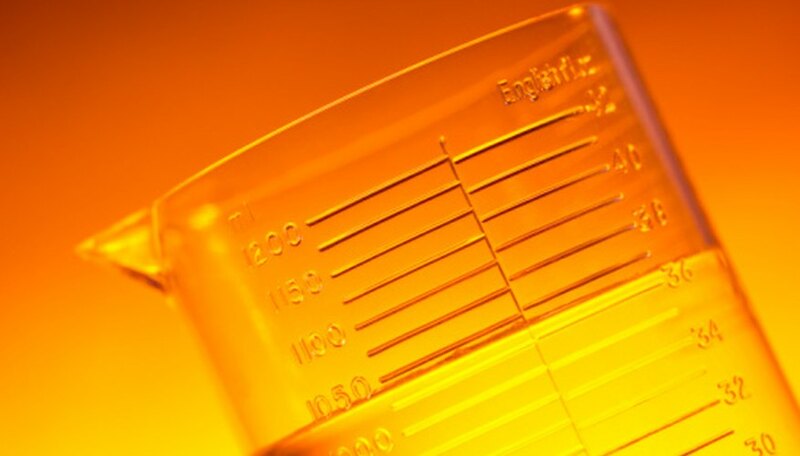 A more complicated set of calculations that take density into account is required to convert milligrams to fluid ounces for liquids other than water. Based in New York City, Mark Koltko-Rivera has been writing psychology-related articles since 1987. His articles have appeared in such journals as “Psychotherapy” and “Journal of Humanistic Psychology.” Koltko-Rivera is a Fellow of the American Psychological Association. He holds a Doctor of Philosophy in counseling psychology from New York University. Koltko-Rivera, Mark. "How to Convert Milligrams to Fluid Ounces." Sciencing, https://sciencing.com/convert-milligrams-fluid-ounces-8389030.html. 24 April 2017.